Hello our dearest Flame Painter & Amberlight artists! When we think about you, we imagine creative, inventive, original, playful and impressive human beings with a good taste for art. These are the attributes we believe every Flame Painter and Amberlight user has. And on the top of that, we really think you like to get competitive from time to time. That’s why we are proud to announce the first Escape Motions artistic challenge in the history! From November 3rd to November 30th you will get the opportunity to flex your artistic muscles and become extremely creative! We are pretty sure you are hiding plenty of amazing talent from us, so we’ve put together a nice collection of inspirational prizes worth $6,000 to motivate all of you to show off! Contest has two categories: Flame Painter and Amberlight. 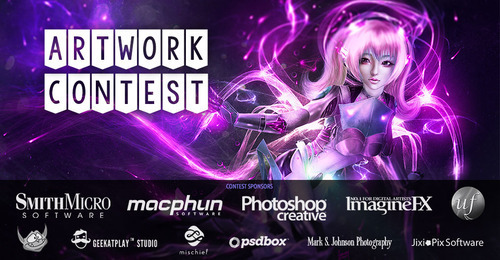 Each entrant may publish one artwork to each category. To enter the contest, publish artwork fully or partially created in Flame Painter or Amberlight to the Contest gallery. Using third party software is allowed. There is no predefined topic specified - the entry may be a fantasy painting, a photo manipulation or abstract composition. Your imagination is the only limit. First five winners in each category will be announced according to the number of “Likes“ their artworks receive in the Contest Gallery. Two Escape Motions’ Choice Prizes in each category will be selected internally by the Escape Motion team. Submitted works will be judged on the strength of their emotive elements and technical excellence. And what is more, it’s not only the winners who get freebies! Every entrant will receive special discount on Imagine FX subscription and Macphun applications. You can visit the Contest website to find out more! We hope this is a great motivation for all of you to have your amazing Flame Painter and Amberlight artworks prepared for November 3rd!